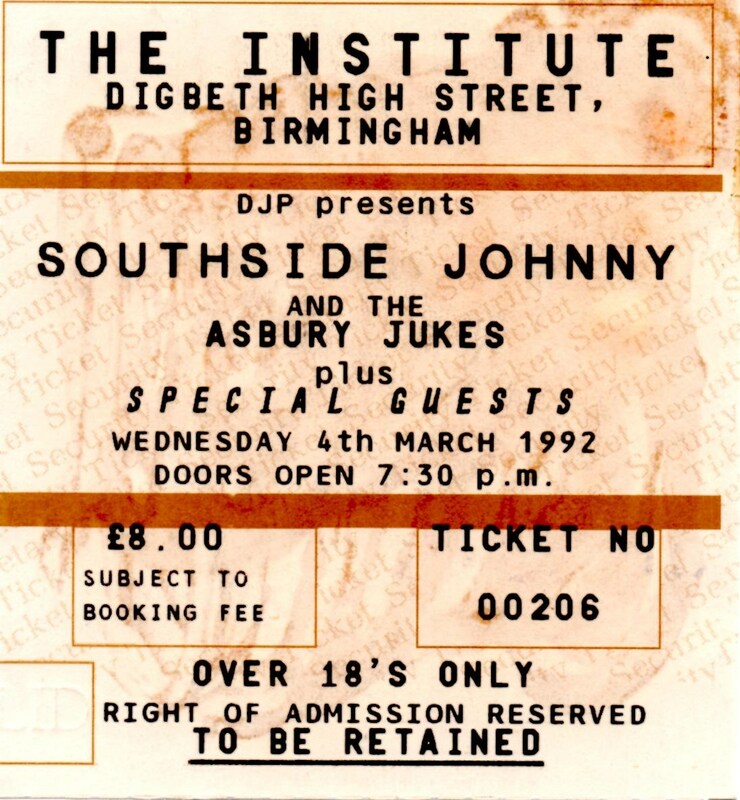 I remember the exact day, date and time I first heard of Steven Jump and “Badlands”, as in the UK Springsteen Fan Club and as per the ticket stub I still have from my first ever Southside Johnny and the Asbury Jukes concert which took place in The Institute, Digbeth, Birmingham on Wednesday 4th March, 1992 – the same day that “Human Touch” and “Lucky Town” were released. I was sure I would come out after the show and find my car sitting on bricks – if I was lucky – but happily, as I returned to find everything as I hoped it would be, I was, in fact, clutching a “Badlands” flyer that someone had given me on the way out… a flyer that would ultimately open so many proverbial doors for me. I also remember sitting on the stairs in my house in Redditch shortly after the Digbeth show, zombified after dialing Ticketmaster non-stop for about an hour and a half trying to get Springsteen tickets when my friend Louise reminded me about the “Badlands” flyer. I called the number in Cheltenham, spoke to Steven, he gave me another number to try and I got through first time. That is but one example of the community spirit and expertise that “Badlands” is globally recognised for and which has been acknowledged in the credits of the “Springsteen and I” rockumentary that was released earlier this summer. The “Badlands” story began in 1986 and was mostly about selling records from their store in Cheltenham. I know Steven was also a big Rolling Stones and Bob Dylan fan, and by the time I came onboard in ‘92, the “Badlands” record store was already well established as THE place to go for news about Springsteen releases, tour dates etc. They had also become well-known for organising tours to see Bruce concerts both in Europe and the USA. I had my first “Badlands” trip to New Jersey in December 1995. It was “The Ghost of Tom Joad” tour and together with 58 like-minded others, we saw Bruce Springsteen perform 2 shows in the Tower Theatre, Philadelphia. That trip left such an impact on me that I simply had to go back again for more of the same and I ended up becoming The Jersey Shore Editor (working together with Steven) for the “Badlands” fan magazine, The Ties That Bind which had by then, replaced the original, For True Rockers Only publication. When I learned the sad, sad news of Steven’s passing earlier today, I was – and continue to be – lost for words… he was always just so totally full of life, was great company to be in and he simply staggered me with his mind-boggling knowledge about music. I shall certainly miss hearing his voice on the end of the “Badlands” phone but I will always be grateful for his friendship these last 20+ years. Sincerest condolences to Philip, his brother and “Badlands” business partner as well as to the Jump family. Your loss is shared deeply by everyone whose lives were enriched through knowing Steven.